This year marks the 50th anniversary of WIN House. It gives us great pleasure to be a part of this significant milestone event! Our 50th anniversary offers us a unique opportunity to remember our past, celebrate the present, and to dream about our future. Over these 50 years, we’ve served thousands of women and children, providing emergency shelter, support through our programs and services, and giving new beginnings to women fleeing domestic violence. WIN House started in Edmonton in 1968. During that year, a group of citizens met to pioneer a project to address the needs of homeless women in our city. By 1970, an overnight shelter was established in All Saints’ Cathedral basement under the umbrella of the YWCA, then the Edmonton Social Planning Council. In 1973, under its own umbrella formerly known as Edmonton Women’s Shelter Ltd, WIN House became incorporated as a non-profit organization. The goals were to provide accommodations and promote the well-being, health, development, and welfare of women regardless of circumstances. The shelter would move two more times before the official opening of the Women’s Accommodation Center in October 1974. Through committed members, advocates and public meetings, WIN House was able to obtain funding to open our very first shelter in 1977. By September of 1978, a house was purchased by the Clifford E. Lee Foundation and leased to WIN House for $1.00 per year with a ten year renewable lease. Renovations soon began on WIN I and doors opened that following December. From 1978 to 1982, 751 families were served but 1,420 families were turned away. Between 1978 and 1988, WIN House saw rapid growth financially and operationally but it didn‘t address the growing number of turn-aways due to lack of space. By March of 1981, an expansion committee was established for a second facility. A property was puschased in June and construction began. By November of 1982, WIN II opened its doors. During 1983 to 1988, numerous studies were done to address growing concerns within our city such as child abuse, second stage housing and abuse of the elderly. By 1990, WIN House was accommodating not even 25% of the families requesting shelter. The number of families refused space had steadily increased from 441 in 1986 to 971 in 1990. In 2002, the Clifford E. Lee Foundation gifted WIN I to WIN House; the house then underwent extensive renovations. The new facility reopened in April of 2004 with 9 additional beds and a wheelchair accessible suite. The spring of 2010 brought with it new beginnings, and we opened WIN III as a project with Changing Together for immigrant, refugee, and human trafficked women. WIN III lost funding for a short period of time in 2013 and had to close its doors, but re-opened as “Carol’s House” in 2014 with a generous contribution by the Katz family. This was in honour of Renee Gouin-Katz’s mother Carol Gouin, a lifelong supporter of women’s causes. Today, WIN House operates 3 shelters accommodating up to 70 women and children with meals, clothing, nurses, crisis intervention support, child support, pet care, valuable links to housing, legal, employment and educational services, and numerous post-shelter goods and services. To this day, we continue the 1968 legacy of supporting and empowering women in our community. 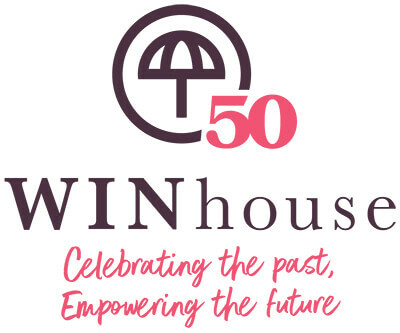 As we celebrate the 50th anniversary of WIN House this year, we remember our past but also celebrate and dream about our future. The world has changed and is more complex, diverse and multifaceted than it was in 1968 but we have all grown with it. What defines us and remains the same is our desire to inspire, instill and deliver ‘real successes’ with the women and children we serve. While our progress remains commendable, we will persist to ensure women are safe, proud and prosperous.